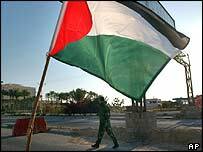 Palestinian faction leaders meeting in Cairo have agreed to continue an informal truce with Israel. The final statement from the 13 Palestinian groups agreed to maintain an "open-ended" stop to hostilities, but did not specify a timeframe. The gesture was tied to Israel's commitment to end attacks and release prisoners, Palestinians officials said. Israel has said it expects Palestinian leader Mahmoud Abbas to disarm the militant groups. "Israel sees the discussions in Cairo as problematic, in that they only talk about a temporary time-out," Israeli foreign ministry spokesman Mark Regev told Reuters news agency. "Mr Abbas must disarm the terrorist groups and we hope that the process of disarmament will start sooner rather than later." Mr Abbas and Israeli Prime Minister Ariel Sharon agreed on a ceasefire in February at the Egyptian resort of Sharm al-Sheikh, hoping to end four years of violence. Mr Abbas had hoped to persuade militants from Islamic Jihad and Hamas to join the truce formally. A member of the Fatah central committee told reporters that a full truce would require Israel to stop what he called its aggression against the Palestinian people and release all its Palestinian prisoners. Hamas said Israel would have to stop building its West Bank barrier if there were to be a ceasefire. The negotiations in Cairo, which began on Tuesday evening, are part of a long-running dialogue in which Hamas is pressing for a greater say in Palestinian decision-making.